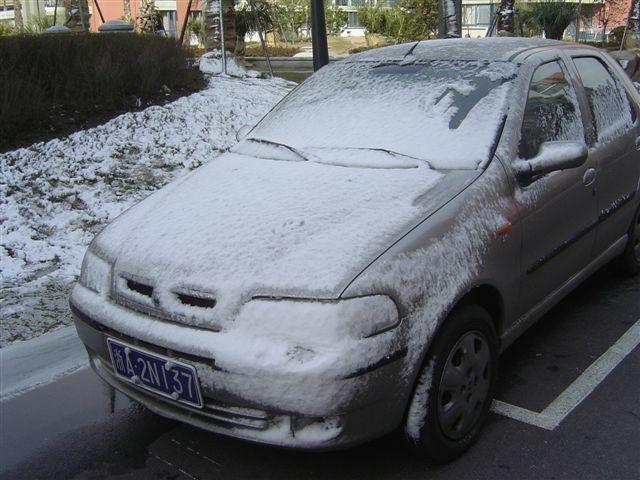 My friends outside Shanghai didn’t believe it snowed in Shanghai. I can understand that, because the last time I clearly remember it snowed in Shanghai was in 1996. OK. Let me proof it. © Jian Shuo Wang. Goudaner covered by snow. The picture was taken at 1:01 PM, Feb 19, 2005. It snowed at the night of Feb 18 and my car looked like this when I walked to my car in the afternoon. It took me quite some time to clear part of the window so I can drive the car to somewhere in the Sun. Very soon, it all melt so I can start my journey. It is rarely snow in Shanghai. The year of 2005 is abnormal. It snowed many times – I guess more than 5 times already. The temperature varience is big. It was 0°C on Sunday and today, it is 11°C already (all according to the meter in my car). This is the adverse weather pattern which is haunting the world for last twenty years due to global warming. Perhaps we should seriously look forward to Kyoto accord and install emission abatement plan by every Nation of this planet. Yes yes, abnormal weather across the global, we should promote the use of hybrid cars, such as Toyota Prius, or even the introduction of fuel cell cars to reduced CO2 emission. It looks nice, I like this photo.